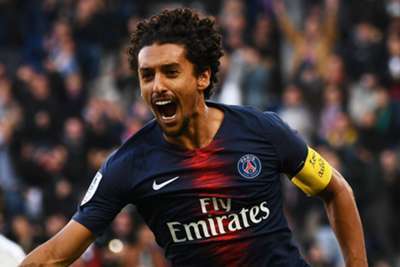 Paris Saint-Germain's winning streak at the start of the Ligue 1 season was extended to 10 games in the rested Neymar's absence as the reigning champions scored three late goals in a 5-0 win over Amiens. Neymar was given the afternoon off after representing Brazil in Saudi Arabia four days earlier, but Marquinhos, one of his team-mates in that game, headed in his first league goal since May 2017 to send PSG on their way. The opener came from Angel Di Maria's corner and the Argentinian sent in another near-post delivery from a set piece that Adrien Rabiot nodded in to make it 2-0 before half-time. Ferney Otero headed into the side-netting for Amiens late on but that only seemed to stir PSG into life as Julian Draxler, Kylian Mbappe and teenage substitute Moussa Diaby all scored in the final 10 minutes. The result ensured Thomas Tuchel's men maintained their perfect start and coasted to a 10th straight win in 2018-19. They have scored at least three goals in each of those victories. Any fears of PSG's momentum being halted by the international break were quickly dismissed as Di Maria's 12th-minute corner was flicked in by Marquinhos' head at the near post. Amiens were left feeling a sense of deja vu three minutes before half-time as another Di Maria corner from the right was also nodded in by a glancing header, with Rabiot the scorer this time. It should have been 3-0 at half-time but Edinson Cavani somehow sliced wide with a virtual tap-in from Juan Bernat's left-wing cross. Amiens were denied a route back into the game early in the second period as Alphonse Areola made a double save from Thomas Monconduit and Saman Ghoddos. A nervy finish for PSG might have been in store had Otero's header from a corner gone inside the post rather than hitting the side-netting, but two more goals for the hosts in two minutes put the result beyond doubt. An unmarked Draxler headed in the third before Mbappe got in on the act with eight minutes remaining, placing a shot between a defender's legs and inside the near post. There was still time for Diaby, who had come on for Di Maria, to dance through and fire in a fifth too. Tuchel's side were not at their best for much of Saturday's game but even then they were able to maintain their perfect start with ease. A trip to Marseille next weekend will be a sterner test, though Neymar should be back in the line-up then too. Both of PSG's first-half goals were created by former Real Madrid and Manchester United man Di Maria. Since his debut in 2015, he has 36 assists in Ligue 1 – the most in the division. Even with Neymar missing, Amiens would have expected a difficult afternoon but they were architects of their downfall. Marquinhos' opening goal from Di Maria's corner was all too easy and could have been prevented had Amiens had a man on the back post, and that region remained unguarded as Rabiot's effort went in off the woodwork for the second. - Amiens have suffered their worst defeat ever in Ligue 1. - PSG have scored 37 Ligue 1 goals in 2018-19, the highest tally at this stage since Saint-Etienne in 1969-70 (also 37). - Draxler has scored two goals in his last five Ligue 1 games, as many as in his previous 23. - Diaby, with two goals and three assists, is the second-youngest player (19 years and three months) to be involved in five-plus goals in the top five European leagues this season, only behind Jadon Sancho (18 years & seven months – two goals and six assists). - Di Maria has delivered 36 assists in Ligue 1 since his arrival in 2015, at least 14 more than any other player. It is a return to the Champions League for PSG on Wednesday as they host Napoli before travelling to Marseille next weekend. Amiens play again in seven days' time against Nantes.